Why are European countries lining up for the new Zvyagintsev film? Director Andrey Zvyagintsev: "I'd like this film to be compared to Ingmar Bergman's 'Scenes from a Marriage'". The film 'Loveless' has not yet been seen by anyone, but its producer said all major European countries have already bought it. The director hopes to finish the film, which is made in cooperation with France and Germany, in time for the Cannes Film Festival in the second half of May. Andrey Zvyagintsev, creator of the critically acclaimed Leviathan, said his new film, Loveless, set a sales record at the Berlin film market, and was bought for release by all major European countries. "In Berlin, deals were signed with companies from the U.K., Spain, Denmark and Finland. Rights for all European territories have been sold. What remains is to close several deals with companies from Asia and Latin America," said producer Alexander Rodnyansky at the end of the film market. Distributors, however, have not seen a single frame of this new film by the Russian winner of the Cannes and Venice film festivals. This is because Loveless is not ready yet, and it's not clear whether Zvyagintsev will complete it by the second half of May - its world premiere is expected to be in the main competition at the Cannes Film Festival. 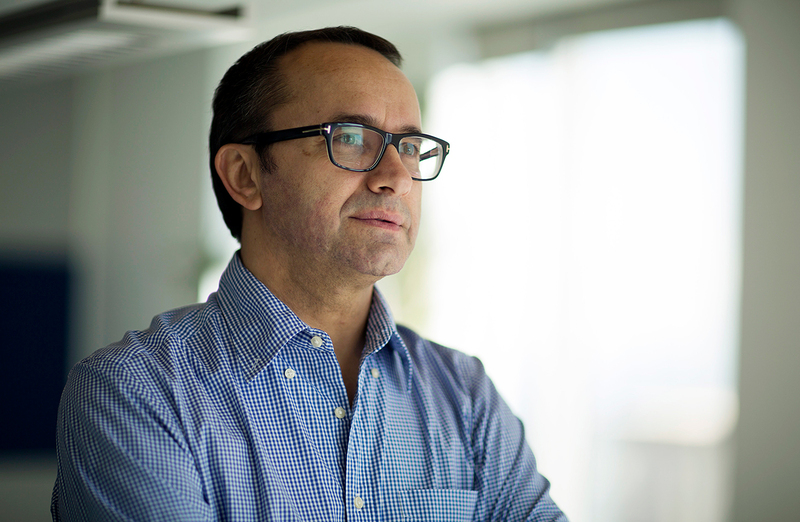 To clarify the situation, RBTH caught up with Zvyagintsev, who told us how the idea for his new film came about and why he's anxious about the result. After the success of Leviathan you were going to make a big film about World War II. But you're now making a completely different movie, aren’t you? A minor correction: I was planning a film about the War even before Leviathan. It's a long-standing idea, with a written script, and I'm ready to start filming it at any time. Unfortunately, not everything depends on my desire because the project is expensive – we're talking about $15-$18 million. It will be extremely difficult for the producer to recoup that sort of money. So, I don't yet know if this film will happen in the near future. So what is your new film about? It's the story of a family living through serious moments in their life, as the husband and wife split. I'd like this film to be compared to Ingmar Bergman's Scenes from a Marriage. Practically throughout the whole six episodes, 45 minutes each, all you see on screen are just the two actors - Josephson and Ullmann. And you can’t tear yourself away from the screen. His characters are people who think and talk. She, as was fashionable in the 1960s, keeps a diary and reads out excerpts from it. Those scenes show that intelligence, the ability to analyze, civility and refinement cannot prevent a terrible catastrophe. The idea for Loveless grew from this, and I will be honest with you - I have long been partial to that film by Bergman. Oleg Negin, who writes the scripts for all my films, discussed with me the idea of examining a marriage crisis when people who have been married for 10-12 years cannot go on living together. In the script there's an event that dispels the tangle of contradictions between the characters - their child goes missing. At what production stage is Loveless currently? Filming was supposed to be completed by spring 2017. Alas, Moscow weather interfered. The film takes place in Moscow, when it's warm, and so we need grass and leaves on the trees. We started filming in August and were hoping to finish by November, but it started snowing in the middle of October and the snow has remained since. So, we had to halt shooting, and we're now waiting for April in order to finish filming everything that needs to be completed. Unfortunately, all this creates certain difficulties, and that's why I started editing even though I had never done so before the completion of filming. I always edit my films sequentially - from the first scene to the last. Since editing determines the rhythm of a film, and rhythm is the musical form of a film, I think it's a mistake to suddenly launch into the 40th minute of a film and start editing it from there. But the circumstances are such that we're forced to make this mistake. It worries me, but I think we'll cope. After your films, the Russian actors in them become famous internationally: Nadezhda Markina was nominated for a European Film Award for her role in Elena, while Elena Lyadova, the star of Leviathan, also became a well-known face. At the same time, you rarely cast actors who have worked with you before. Is this one of your principles as a director? I never know who will star in my films. There has been just one exception: Oleg Negin and I knew that the role of the town mayor in Leviathan would be played by Roman Madyanov. Sometimes, I deliberately do not want to work with an actor who has been in my film before, but then life suddenly interferes. Such was the case, for example, with Konstantin Lavronenko. He acted in my first film, The Return, which unexpectedly became an international festival hit, winning the Golden Lion at the Venice Film Festival. That success, of course, put a lot of pressure on me, and I wanted to make sure that with my second film I'd not be accused of repeating myself. So for the main role in my next film, Banishment, I looked for a young actor since the character is supposed to be in his early 30s. But the longer I searched, the clearer it became to me that my prejudice against Lavronenko was groundless, and when I finally invited him for an audition, it all came together - it was his part. Yet, it so happens that apart from Kostya there is just one more person whom I have cast in a big role more than once. And that person is Elena Lyadova, who has become a major star thanks to your films. Would you describe her as your muse? I don’t think so. Of course, I like her very much, but I do not recognize any personal likes when choosing an actor for this or that role. Once, my casting director brought an actor to an audition who was absolutely unsuitable for the part. I asked her why. She answered, "Well, he's from Novosibirsk!" (Andrey Zvyagintsev's hometown - RBTH). That’s when I showed my temper and told her that I film actors, not relatives. I first met Lena when I was making Banishment. She voiced the French actress Maria Bonnevie in that film. Incidentally, she had to go through a very tough casting process for that. My casting assistant and I listened to the applicants’ voices imposed on Maria’s picture. To avoid any bias, I did not want to know what the actresses looked like. Out of 70 voices, we chose Lena's, and I worked with her on Banishment for about a week. So, by the time I started looking for actors for Elena, I knew her quite well. Her part in Elena was small, just seven days of shooting, and when those days were over I was left with a feeling that something was not quite completed. I wanted to work with her more, and that opportunity came in 2011. Then, a year later we started casting for Leviathan. Did you invite Lyadova for casting yourself? Yes, I knew that we had to try her. I believe that she has enormous acting potential. It's impossible to explain a task to an actor in words - this task is simply bigger than what you can put into words. But when an actor feels this task, then all you need to do is just not to be in their way. Lyadova is such an actress, who feels a role at once – with her mind, heart and every cell in her body. At the same time, your films leave one with the impression that you're far from that type of director who allows actors much latitude. Is this correct? Often, actors like to steal the show and overestimate the value of their ideas. When shooting Leviathan I accidentally let it slip that two characters in the film had served in the army together for three years. "Aah, three years in the army ... That changes everything!" one of the actors said. That roused me and I told him, "Ok, let's do two takes now. The first - as if you served together, the second - as if you know nothing about it." There was no difference. It doesn't mean that actors shouldn't do homework. Of course, they should. And they should come to the set with ready sketches and ideas. But all that is required of them after the word "action" is to be truthful here and now, without thinking ahead that in two minutes’ time something will happen to their character. In the theater the actor is a full-fledged co-author, but in film, it's a very different story. I even go as far as not letting the actors read the entire script. If I could have it my way, I'd give them only those scenes that are shot on that day. Maybe, by the way, I will make such an experiment. You're probably the best-known Russian film director in the world today. For that, Russian journalists sometimes call you "a director for export." Does it bother you? I try not to read reviews, but it's impossible to completely shut oneself off from it all. For example, during one talk show I was accused of being an anti-Russian director because I often criticize the country that brought me up. This is utter nonsense. During that same talk show I said I feel myself a citizen of a country called Cinematography. I do not recognize national boundaries in cinema. That's why I don't take a special interest in what's happening in Russian cinema, or in American, French or German cinema. I'm interested in directors who make good movies, regardless which national school they belong to. A good film director is universal in his/her appeal: their films will be understood in Russia, in America, and anywhere else. The fact that my films are accepted and understood in the West means that I'm able to talk to people of different nationalities with a common language. This is far more important than trying to force oneself into narrow national boundaries and take pride in one’s "Russianness."